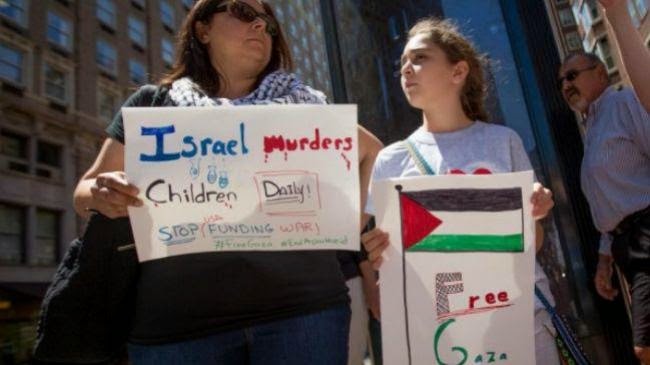 Jewish protesters organized demonstrations against Israel in 15 cities across the United States, condemning Tel Aviv for atrocities it is committing against Palestinians. The protests organized by Jewish Voice for Peace were held Friday in Boston, Chicago, Los Angeles, New York, Philadelphia, and San Francisco, among other cities, and drew thousands demonstrators. As demonstrators across the United States were holding protests, the US House of Representatives expressed support for Israel’s deadly strikes against Palestinians in the Gaza Strip. Lawmakers in the lower chamber of US Congress voted in favor of a non-binding resolution that acknowledges Tel Aviv’s right to what they call self-defense.